Even though it’s been raining here in California—or snowing where you are—across the country people are beginning to register for breast cancer walks or runs in anticipation of sunnier days. Every spring, breast cancer industry giants like Komen kick off their annual fundraising walks and runs. Before you lace up your sneakers or pull out your checkbook, be sure to exercise your mind by asking these 4 questions. Komen says they’re making changes this year, but the truth is they’re just painting a new color over their worn out pink. Komen’s two iconic marketing tools, the pink ribbon and Race for the Cure®, are getting a makeover. The event will now be called the “More than Pink Walk” and instead of pink shirts, participants can choose from a rainbow of colors! The color pink itself was never the problem. Komen’s new rainbow of color solves nothing if their walk expenses exceed their program spending, if they continue to promote misleading statistics that falsely reassure people, and if they continue to include simple narratives that exclude anyone who isn’t a cheerful “survivor.” These events have long been multi-million dollar marketing bonanzas that too often benefit corporate reputations more than women living with and dying from breast cancer. How much of the money raised from the walk will go to breast cancer programs? What breast cancer programs or research will the walk fund? Do the walk’s sponsors increase women’s risk of breast cancer? Does the walk present a one-sided picture of breast cancer that leaves some women out? 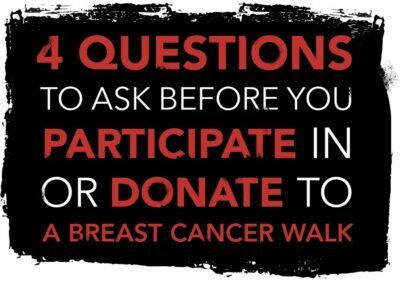 Learn more about why it’s important to ask these questions and read about alternatives to breast cancer walks. Print and share our questions to help spread the word! Want to make sure money raised for breast cancer goes to meaningful change? Ask your friends and family to donate to your “Don’t Pink For Me” fundraising page. 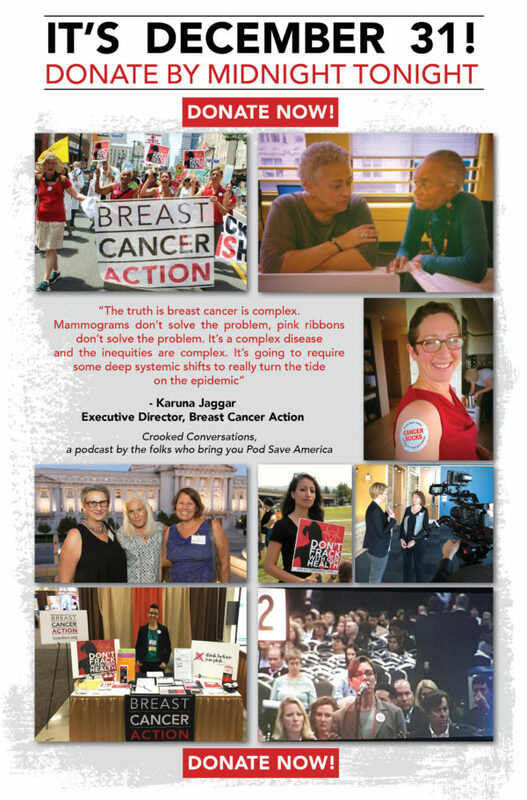 Spread the word about Breast Cancer Action’s work to address and end the breast cancer epidemic and help fund our people-powered activism. We’ve probably all done it. Even if we know we shouldn’t. We’ve turned to the internet when we’ve got questions about our health. But when it comes to reliable breast cancer information, we all deserve better than “Dr. Google.” That’s where Breast Cancer Action comes in. We need to raise $25,000 by April 30 so that we can continue to provide evidence-based, unbiased, and understandable treatment information about breast cancer. Please make a donation NOW! The truth is, the influence of industry has never been greater. Even the most well-intentioned healthcare providers work within a system where Pharma and biotech’s influence is overwhelming. Many patient advocacy groups have long been in the pocket of industry, but now corporations are even paying breast cancer patients with a large following on social media (so called “influencers”) to promote their business interests. All this makes it harder to know who you can trust. Donate now! Help us push back on corporate influence.Our commitment to providing balanced information, so everyone can make fully informed decisions about breast cancer, is at the core of our work. We don’t tell people what to do, but we help people across the country navigate the many decisions that come with a breast cancer diagnosis—whether we’re fielding questions about the tradeoffs of hormone therapies, surgery choices, the role of watchful waiting for DCIS, or managing side effects. Your gift today will ensure that Breast Cancer Action has the resources to provide these vital services. Breast Cancer Action will never take funds from Pharma or biotech, so you can trust we’re ready to go toe-to-toe with industry. And we’ll always put patients first. 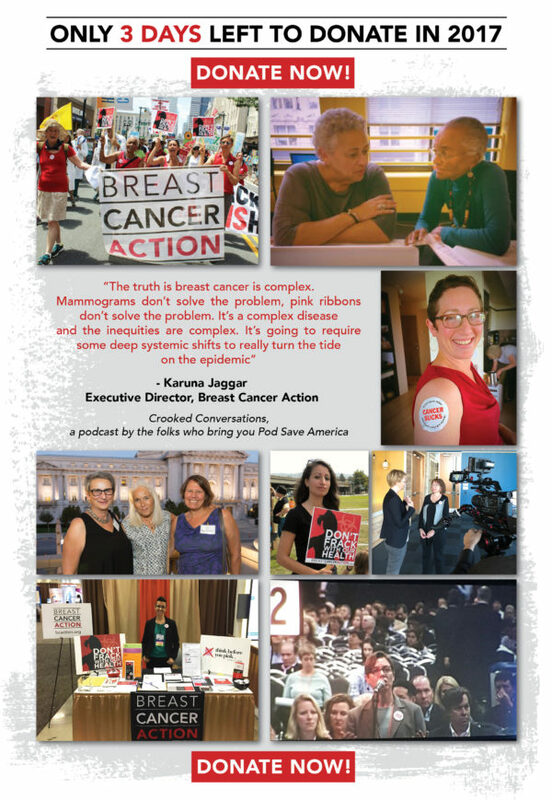 We’ll always tell the truth about the breast cancer epidemic, just like we do in our new info sheet, What You Need to Know About Metastatic Breast Cancer. Your support makes our work possible. Thank you. P.S. Read our new metastatic breast cancer info sheet here. We’re wrapping up 2018 with a MATCH donation drive! 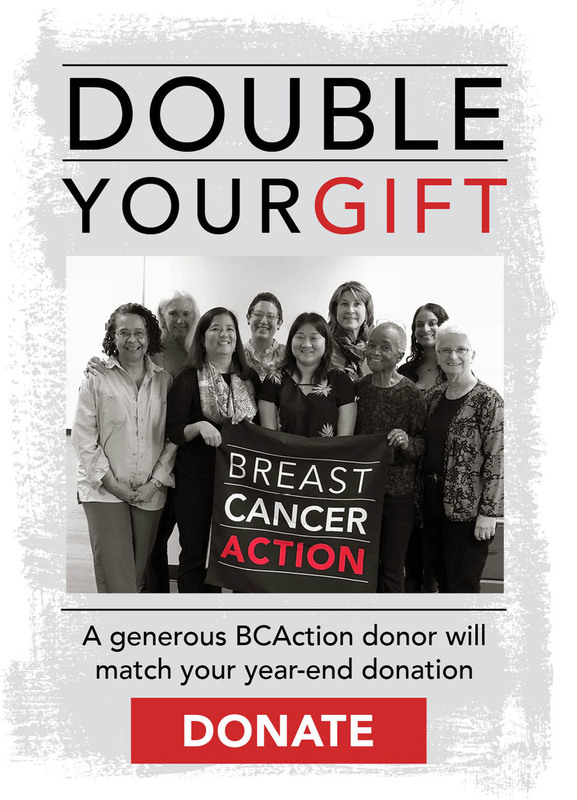 Make a year-end gift to Breast Cancer Action now and it will be matched dollar-for-dollar. All year, you’ve taken action with us and proven again and again that we’re powerful when we join together as a community. Thank you! And we’re thrilled to share that, with just four days left in 2018, a long-time Breast Cancer Action supporter has stepped forward to generously match all year-end donations, dollar-for-dollar, up to $10,000. There’s no better time to give because every donation we receive between now and December 31 will be DOUBLED. Make twice the impact by giving now! In 2018, your determination and belief that you can make a difference helped us hold the powerful accountable. Thank you. Stand strong as an independent watchdog and provide an important counter balance to hyped-up headlines and corporate influence. Provide strong regulatory and legislative advocacy that puts public health before corporate profit. Demand systemic changes that will reduce our involuntary exposure to toxic, cancer-causing chemicals and stop cancer before it starts. Your support matters so much right now. Please help by making your year-end gift to Breast Cancer Action today and know your gift ensures we can stand strong as the watchdog of the breast cancer movement. Our values infuse every level of our work, including where we get our money. At Breast Cancer Action, we aren’t in the pocket of any industry and our strict conflict of interest policy makes all the difference in the world in our work. We’ll never be a mouthpiece for the breast cancer industry, which means you can always count on us to put your health, well-being, and community needs before the interests of pinkwashing and polluting corporations. All that we have and will accomplish is because of the commitment and support of our grassroots community—members like YOU. Please give as generously as you can and your year-end donation will be MATCHED. If you have already made your gift, please accept our sincere thanks! If you have any questions or need help making your donation, please contact Lopa Pal at lpal@bcaction.org or (415) 243-9301 x19. Breast Cancer Action’s work is deeply personal. Join me by making a year-end donation in honor or memory of a loved one. Our stories join us. And by taking action together, we remember and honor our loved ones by working for a world where fewer people are diagnosed with and die from breast cancer. It’s been fifteen years since I was first stunned by the December breast cancer diagnosis of a family member who seemed invincible. Last year at this time, I was in treatment for my own cancer. Although I’m doing well and have finished treatment, too many others in my community are living with metastatic disease and will be in treatment for the rest of their lives. Your donation today is a commitment to creating a better world and to achieving health justice for everyone at risk of and living with breast cancer. We’ve accomplished so much with your support. Over the years, we’ve fundamentally changed how people think and talk about abreast cancer. But there is still so much to do. Every day, we work tirelessly to support people living with breast cancer, honor those who have died, and protect the health of future generations. For 28 years, Breast Cancer Action has offered free, unbiased, one-of-a-kind information about breast cancer to anyone who needs it. Our conflict of interest policy means you can always trust that our analysis is unbiased, science-based and patient-centered as you make deeply personal health decisions. And through regulatory and legislative advocacy, we work to eliminate involuntary exposures to chemicals that increase the risk of the disease—or interfere with treatment!—so fewer people are diagnosed in the first place. Breast Cancer Action was founded by a group of women living with, and dying from, breast cancer. Your support builds on and carries forward the legacy of the fearless and feisty activists who have been part of this remarkable organization over the decades. 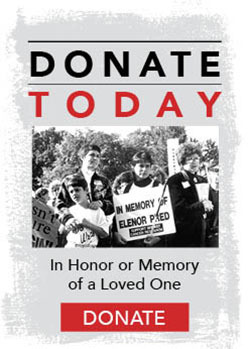 We are deeply grateful for your donation in honor or memory of your loved one. Thank you for investing in Breast Cancer Action’s work to create a world where lives and communities aren’t threatened by breast cancer. 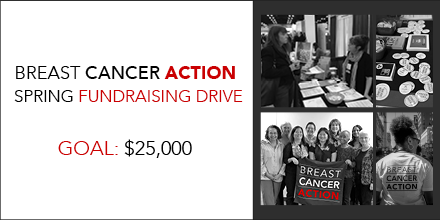 If you have any questions or need help making your donation, please contact Lopa Pal at lpal@bcaction.org. At Breast Cancer Action, we believe health justice is a human right. And by joining us now, you are helping to put people’s health and well-being over corporate profits. Your donation of $50 or more makes a huge difference. Make your year-end gift now to create a more just and healthier world. We know that breast cancer is a social justice issue and a public health crisis. Our vision is a world where world where lives and communities aren’t threatened by breast cancer. 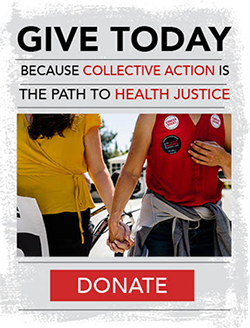 We connect the dots between public health and environmental justice and this year we helped lead a broad coalition to pressure California’s Governor Brown to end dangerous oil drilling practices that are fueling cancer and climate change. We provide one-of-a kind services that empower people with evidence-based information about breast cancer for anyone looking for independent tools and analysis to help make deeply personal health decisions. We create space for the diverse voices that have been silenced and ignored by mainstream pink ribbon culture and we refuse to be shamed and blamed for our breast cancer. We hold our regulatory protection agencies accountable by speaking out and mobilizing our community, like our opposition to the EPA rule that would restrict the agency’s use of critical environmental health data. With your support, we will continue our work to achieve health justice for everyone at risk of and living with breast cancer, so that fewer people are diagnosed with and die from this disease. Donate now to put patient interests before corporate profits. It’s #GivingTuesday. Double Your Impact! Today is #GivingTuesday, a global day of giving back! Every dollar you give now through midnight will be DOUBLED thanks to the generosity of Lesbians for Good at the Horizons Foundation who will match every gift, dollar-for-dollar, up to $25,000! With your help, we can raise $50,000 today to fund our uncompromising activism. Because it takes more than pink ribbons to address and end the breast cancer epidemic. We never take corporate funding from companies that profit from or contribute to breast cancer. Our fierce independence means we do the work other breast cancer organization don’t. Breast Cancer Action is a lean organization with an outsized impact and we raise 70 percent of our funding from individuals like YOU. DOUBLE the impact of your donation today! It’s no accident that our founders chose the name Breast Cancer Action. Action leads to change and is a powerful antidote to the pervasive fear and sadness surrounding the disease. 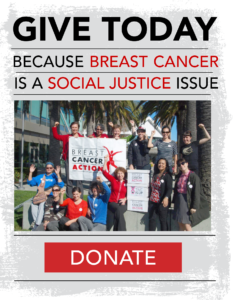 And it’s in the spirit of collective action that we ask you to GIVE NOW to help fund our work to achieve health justice for all women at risk of and living with breast cancer. 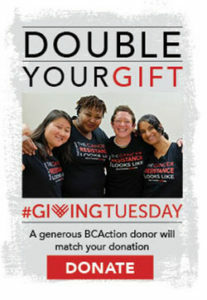 When you donate to Breast Cancer Action before midnight tomorrow, your #GivingTuesday gift will be DOUBLED. As people everywhere give back to nonprofits as an alternative to the consumerism that surrounds the holiday season, your donation to Breast Cancer Action will have TWICE the impact. To get an early start on your giving, donate now and the impact of your gift will be DOUBLED! Every #GivingTuesday donation up to $25,000 will be generously matched by Lesbians for Good at the Horizons Foundation! This means your $25 gift becomes $50, your $100 gift becomes $200, and your $500 gift becomes $1,000. Now is the time to give! Help turn $25,000 into $50,000! Breast Cancer Action is a lean organization with an outsized impact that never takes corporate money from companies that profit from or contribute to cancer. And we raise 70 percent of our funding from individuals like YOU during this time of year. We need your help to meet—and exceed!—our #GivingTuesday fundraising goal, so we have the funds we need to continue our work to achieve health justice for all women at risk of and living with breast cancer. After your donate, be sure to invite your friends and family to join you in making a donation to Breast Cancer Action right now, while every donation is doubled. 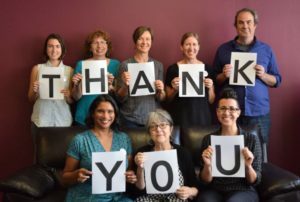 Thanks so much for supporting our work! Food for Thought 2018 – Early Bird Tickets Available! Every October we challenge the cancer industry and go after the most egregious pinkwasher of the year. Join us October 15 for our 8th annual Action Speaks Louder Than Pink – Food for Thought fundraising dinner to support the campaign. Early-bird tickets are now available! Last year, we had a full house and we don’t want you to miss out on what’s sure to be another powerful evening. Get your tickets today. Ticket prices will go up after September 21. The event will feature a powerful program highlighting our award-winning Think Before You Pink® campaign and a delicious four-course meal prepared by some of the Bay Area’s best (and most generous) chefs, including Eric Tucker from Millennium, Trudy Schafer from the Healing Hearth and Sascha Weiss from Project Juice. It’ll be an evening you won’t forget. We promise. Vegetarian and vegan options for all courses available upon request. If you can’t join us in person, please consider joining us in spirit by making a donation or becoming an event sponsor. All proceeds from this event benefit our work to address and end the breast cancer epidemic. We look forward to seeing you October 15! “Do something besides worry.” I was struck by the simple power of this slogan when I first came to Breast Cancer Action for a summer internship in 2007. Now, as the Communications Manager for this radical and compassionate organization that never shies away from the hard truths, the phrase rings just as true. With Pinktober just around the corner, I’m excited to share some ways that you can “do something” to get ready for the onslaught of pink and to challenge the hypocrisy of the breast cancer industry. Brush up on our “Critical Questions for Conscious Consumers“so you’re ready to assess all the pink ribbon promotions—and help your community do the same. Create a “Don’t Pink For Me” fundraising campaign to support Breast Cancer Action.You can trust us because we’re free from conflicts of interest. Tell your friends and family “Don’t Pink for Me” and ask them to make a donation to Breast Cancer Action in your honor instead. Spread the word about our work and tell your friends to sign up for our emails: Make sure your family and friends are in-the-know about our campaign when we launch at the beginning of October. Like us on Facebook and follow us on Twitter. Be ready to “like” and share our posts with your friends and retweet us using our this year’s Think Before Your Pink®campaign hashtag. Your active engagement helps amplify our message! 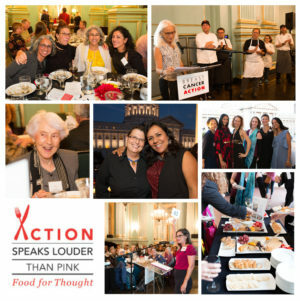 Gather with others in the SF Bay Area Breast Cancer Action community at our Action Speak Louder than Pink – Food for Thoughtfundraising dinner on October 15 for a thought-provoking program accompanied by a delicious meal. Together, year after year, our collective action has changed the landscape of pink ribbon marketing and made pinkwashing companies change their ways. Let’s do it again this year. We’re counting down the days until we launch this year’s Think Before You Pink® campaign. Watch for an email about how you can join us in action! Breast Cancer Action has always been a radical cancer organization—from our founders to our ever-growing community of fierce, persistent activists. That’s because women’s bodies and women’s health have always been social justice issues. As activists across the country are calling for justice and demanding change, Breast Cancer Action is leading the #CancerResistance! DONATE NOW to support the #CancerResistance! The country is at a crossroads, and people across the country are calling for social justice as part of a broad and powerful growing movement. #MeToo is pushing back on patriarchy and entrenched misogyny. #BlackLivesMatter is shining a light on police violence and racism. #NeverAgain is changing the conversation about gun violence. With your support, Breast Cancer Action is challenging the cancer industry as we lead the #CancerResistance. Our work has never been more important than it is right now. Work that matters for the millions of people who are living with and at risk of breast cancer. Work that can’t be separated from the larger push for social justice. Work that makes sure women’s health never gets sidelined. Your gift is more important than ever and funds our vital grassroots activism. 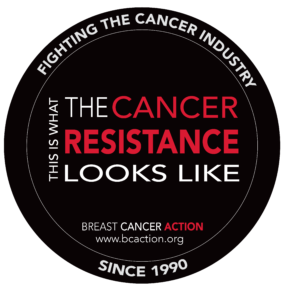 DONATE TODAY and we’ll send you your own “This is What the Cancer Resistance Looks Like” sticker. Thanks to the support of donors and members like you, we’re fighting the cancer industry—the interconnected web of corporations that profit from and contribute to the disease while working hand in hand with multi-million dollar nonprofits to raise billions in the name of breast cancer. And we’ve shown again and again that when people like you and me join together to demand a better world, we can and we do win, against the odds. There’s a lot that needs to change right now to address and end the breast cancer epidemic. And I can assure you, we will persist, until lives and communities aren’t threatened by breast cancer! So much is at stake. Please donate today and join the #CancerResistance. 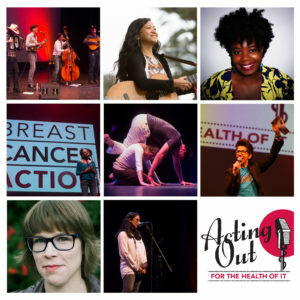 We’re excited to announce that our 6th Annual variety show and fundraiser, Acting Out – for the Health of It, is coming up soon on March 15 in San Francisco, CA. Events like this are a way to connect with your community, and a critical way for us to raise the money that funds our work. It’s also a great opportunity to celebrate our shared values as we recommit to the long-term work ahead of us. We hope you can join us for a fun, provocative evening filled with bold performers who all share a commitment to health justice. Comedian, activist and playwright Luna Malbroux will emcee the festivities. You’ll laugh out loud, enjoy dynamic performances from Bay Area musicians, comedians and dancers and be moved by readings from Breast Cancer Action members. Join us for the VIP reception before the show, and savor delicious hors d’oeuvres, refreshing beverages and an exclusive musical performance! VIP Reception from 6:00 – 7:00 p.m. There will be a program intermission with concession stand snacks and beverages available for purchase, and a silent auction featuring one-of-a-kind dining, fitness and retail experiences. Get your tickets now! And if you purchase more than three tickets today, you’ll get one free entry into our drawing for some fabulous prizes, including two season tickets to San Francisco’s acclaimed Magic Theater. We look forward to Acting Out with you March 15! P.S. If you don’t live in the San Francisco Bay Area, please pass along the invite to your friends and family in the area! Our work is centered on breast cancer, but our impact goes far beyond the disease. We connect the dots between issues and we work at the intersection of feminism, environmental justice, and health activism. Plus, you can ALWAYS count on us to put women’s health before corporate profits because we never take money from companies that profit from or contribute to breast cancer. Donate now to support our work. We have our work cut out for us and we’ve never been more urgently needed than at this critical time, when healthcare is threatened and regulatory agencies are being disempowered. We’re facing reductions in healthcare coverage, an increased risk of exposure to cancer-linked toxins, and weaker standards for treatment approvals. Make your year-end gift now to ensure we have the resources we need to face the current threats. Our grassroots members, like you, ensure we have the resources we need to work tirelessly to support women living with breast cancer, honor those who have died, and protect the health of future generations. There is accountability and transparency in breast cancer fundraising while we challenge mainstream pink ribbon narratives and culture. Knowing what we’re facing, your donation matters now more than ever. Thank you for making our work possible. With heartfelt gratitude and in solidarity. A HUGE thank you to everyone who helped us exceed our #GivingTuesday goal yesterday—together 176 Breast Cancer Action members raised $24,136 to fund our work! Your response to our #GivingTuesday match was awesome and because of incredible members like you, we soared past both our matching goals. Your donations will be put to use right away upholding the highest standards for treatment approvals, working to eliminate exposures to toxic chemicals that can increase the risk of breast cancer or interfere with treatment, uplifiting the diverse voices in the face of narratives that exclude marginalized communities, and pushing back on corporate profiteering off women’s bodies. Giving Tuesday was a great way to kick off a really important time for Breast Cancer Action. We raise 25% of our annual budget during the month of December, and the vast majority of our funding comes from individuals like you. If you haven’t already, I hope you’ll chip in and make your year-end gift today to fund our fearless activism for women at risk of and living with breast cancer. You can help ensure we have the resources we need to put YOU first and stave off the current threats to women’s health and well-being. Thank you from all of us at Breast Cancer Action. We are deeply grateful. P.S. If you made a donation yesterday, don’t forget to fill our your employer’s matching gift form and make your gift go even further. Breaking! Your response to our #GivingTuesday match has been awesome! We’re thrilled to announce a SECOND match: An anonymous donor has offered an additional dollar-for-dollar match up to $5,000. 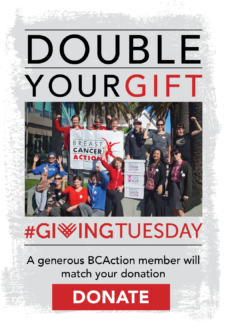 Because of incredible members like YOU, we crushed our $15,000 #GivingTuesday matching goal! Help us crush this one, too. A day like #GivingTuesday is important to us because we don’t take money from companies that profit from or contribute to cancer. We raise a large portion of our funding from individuals like YOU during this time of year. From now until midnight the generous donor will match any donation you make dollar-for-dollar, up to $5,000! Make your Giving Tuesday gift now! Take advantage of this opportunity and help us raise an additional $10,000 by midnight! We can do it with your help! Don’t miss this great opportunity to double your impact and help end the breast cancer epidemic. Every dollar you donate will be DOUBLED! Now more than ever, we need an independent watchdog for women’s health like Breast Cancer Action. And now more than ever, Breast Cancer Action needs your support to fund our work. Donate right now! P.S. #GivingTuesday is a global day of giving back during the consumerism of the holiday season. We’re a small organization with an outsized impact that never takes money from companies that profit from or contribute to cancer. Donate right now to double the impact of your donation. Today is #GivingTuesday and every dollar you donate to Breast Cancer Action will be DOUBLED! Thanks to the generosity of long-time donor Ambassador James Hormel and his husband Michael Nguyen, each dollar you donate will be matched up to $15,000. The current threats to women’s health and well-being are real and immediate. That’s why Breast Cancer Action’s role as an independent cancer activist organization and rapid-response watchdog has never been more urgently needed. Our work is centered on breast cancer, but our impact goes far beyond the disease. Working at the intersection of feminism, environmental justice, and health activism, we connect the dots between issues. Jim and Michael believe in and support Breast Cancer Action’s work—which is why they’ve chosen to leverage their annual contribution to make your donation go even further. 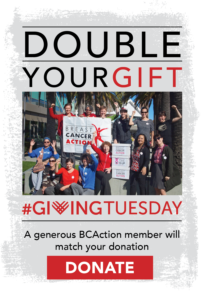 This means your #GivingTuesday gift will have double the impact. Help ensure we have the resources we need to push back on the current threats from an administration that’s targeting vulnerable communities, challenging established science, and bolstering corporate control of our regulatory protection agencies. Your donation today is an investment in social change. Donate now to double the impact of your gift and help us raise $30,000 to fund our work to address and end the breast cancer epidemic. We simply cannot do our critical work without you! Thank you so much for supporting our work to achieve health justice for all women at risk of and living with breast cancer. P.S. #GivingTuesday is a global day of giving back during the consumerism of the holiday season. We’re a small organization with an outsized impact that never takes money from companies that profit from or contribute to cancer. This is a great opportunity to double the impact of your donation. On the 25th anniversary of the pink ribbon, we’re angry. Angry that too many women are diagnosed with and die from breast cancer. Angry that women of color and underserved communities are disproportionately burdened. Angry about the exploitation of the disease for profit. And angry that there’s so little to show for 25 years of pink ribbon awareness and billions spent on pink ribbon products. Join us in calling out the company that started it all, the original pinkwasher. No amount of positive thinking will prevent women from being diagnosed with or dying from breast cancer. The chemicals in their products may increase the risk of breast cancer and might even interfere with treatment. Tell them to clean up their products and stop pinkwashing! The pink ribbon has long since replaced the meaningful actions needed to address and end the breast cancer epidemic. Women at risk of and living with breast cancer deserve better than Estée Lauder’s distraction of illuminating 1000+ world landmarks pink “for awareness.” We deserve more than platitudes to “choose happy,” “laugh often,” and “smile,” which shame and blame us for our disease. And we deserve not to be exposed to chemicals that are suspected to increase the risk of breast cancer—and might even interfere with treatments—by the very company that claims to care about the disease. Estée Lauder’s pink ribbon is “Knot Our Pink Ribbon”—and we’re putting a knot in theirs. 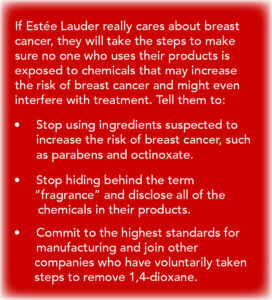 If Estée Lauder is really serious about their self-proclaimed mission “to create a breast cancer-free world,” they will put their marketing, mere awareness, and positive platitudes aside. They will stop pinkwashing and take meaningful action that makes a difference to all women, from allcommunities who are at risk of and living with breast cancer. This isn’t a time for celebration. It’s a time for anger. It’s a time for action. For more about the campaign, read the brief here and spread the word on Facebookand Twitter! Breast Cancer Awareness Month (or as we call it, “Breast Cancer Industry Month”) is less than a month away. It’s time to get ready. Over the years we’ve seen it all: pink fracking drill bits for breast cancer, pink buckets of chicken, pink vacuum cleaners, pink handguns. And, a lot of these pink ribbon promotions do more for a corporation’s bottom line than for women at risk of and living with breast cancer. 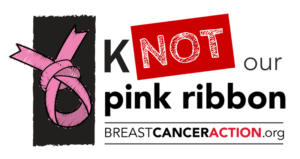 Some pink ribbon products may even increase the risk of breast cancer because they contain cancer-linked toxins, a hypocritical practice we call pinkwashing. But together we’ve made these companies change their ways. Brush up on our “Critical Questions for Conscious Consumers” so you’re ready to think critically about pink ribbon promotions—and help your community do the same. Support Breast Cancer Action through your own “Don’t Pink For Me”You can trust us because we’re free from conflicts of interest. Tell your friends and family “Don’t Pink for Me” and ask them to make a donation to Breast Cancer Action in your honor instead. Tell your friends to sign up for our emails: Make sure your family and friends are in-the-know about our campaign when we launch at the beginning of October. Like us on Facebook and follow us on Twitter. Be ready to “like” and share our posts with your friends and retweet us using our campaign hashtag. 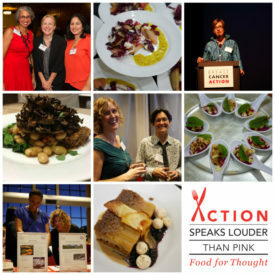 Support our work and gather with others in the SF Bay Area Breast Cancer Action community at our Action Speak Louder than Pink – Food for Thought event on October 16 for a thought-provoking program accompanied by a delicious meal. The best way to prep for the month-long parade of pink is to get ready to use the collective power we have to make change. We truly can’t make a difference without you. PS. Wondering where the pink ribbon came from? Learn about the history here. If you like to eat delicious food and support the work of fierce breast cancer activists, mark your calendar for this fabulous event. Support Breast Cancer Action’s work and mingle with like-minded people, all while enjoying a delectable four-course dinner prepared by celebrated Bay Area chefs. This year Eric Tucker, from Millennium, and Bronson Macomber, formerly of Prosper, are preparing our meal, with vegetarian and vegan options available for all courses. 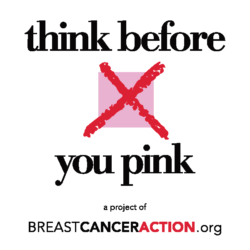 Learn about Breast Cancer Action’s award-winning campaign Think Before You Pink® and this year’s pinkwashing target. We promise, you’ll never see a pink ribbon the same way again. Stay tuned for more information about sponsorships, ticket sales, chefs, and the program. In the meantime, mark your calendars and tell your friends! We hope to see you on October 16th! P.S. Not in the Bay Area? You can tell your friends and family who are to join us, you can support the event as a sponsor, or you can make a tax-deductible donation.